A major flood warning has been issued. 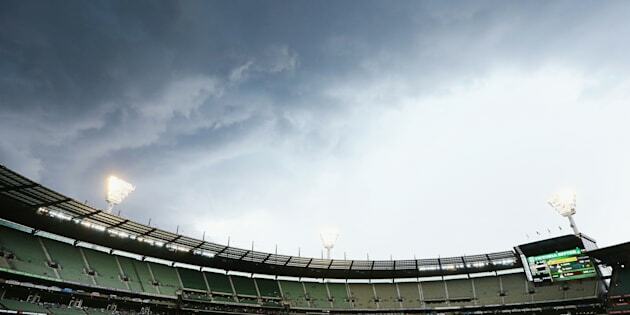 The storm rolling into the MCG. Thunderstorms are sweeping their way across Melbourne as the city faces heavy rain and damaging winds, following what was one of the Victorian capital's hottest nights on record. The Bureau of Meteorology released a severe thunderstorm warning for the city with heavy rainfall leading to flash flooding in some areas. Victoria's Emergency Services issued a major flood warning for Elsternwick Canal/Elster Creek just before 5pm on Thursday afternoon, with locals being told they were in danger and to act now. Emergency services said that flooding above the floor level of single-storey homes may occur in the area, the ABC reports. Vic Emergency said that Melbourne's bayside suburbs have experienced flash flooding and told people to take care, on their Twitter account. "Vic storm front has caused flash flooding, water on the roads & disruptions to public transport. Stay storm safe," they tweeted. There is also flashing flooding on roads including King Street, Centre Road in Bentleigh East and St Kilda Road, the Herald Sun reports. According to BoM the severe thunderstorm warning extends to people in Port Phillip, Western Port, Inner East, Inner, South East, Northern, Outer East, Western and parts of the Mornington Peninsula Local Warning Areas. BoM say the maximum temperature for Melbourne was a humid 32C on Thursday. The night before, the mercury didn't drop below 27-- making it the hottest overnight temperature since 2012 which was 27.4C, The Herald Sun reports. BoM reported on their Twitter than in just 10 minutes, rainfall rates were at 18.6mm in Bulla, 18.4mm at Oakleigh Sth and 14.6mm in St Kilda. Many of those bracing the storms have posted images on Twitter, showing just how severe the conditions are as the storms continue to battle the city.